Everyone can learn to draw realistically, yes, even you! Sticker figures? No problem! More advanced and want to improve? This class is for both of you with individualized instruction in a group setting. Start anytime and come as often as you like. 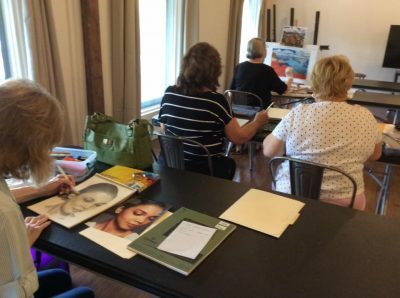 In this weekly ongoing class you will see beginners just getting started or more advanced students working in other mediums. This is a popular class that fills up fast. Reserve your seat by registering online here or call Audrey 417-848-0894. Best of Missouri Hands juried artist, c ommissioned artist for ESPN, Missouri Sports Hall of Fame, Promega Corporation, MSU West Plains, PGA golfers and a host of others, Audrey brings years of professional experience to the classroom. Earning her Art Education degree in her home state of Wisconsin in 1979, she has taught publicly and privately for more than 30 years. Group setting with individual instruction. 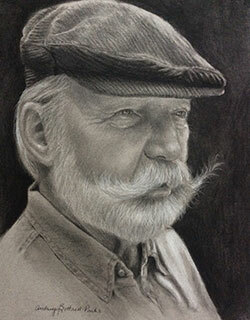 Learn the foundation of drawing, then move on to color. All levels welcome. Audrey was able to clear the mystery of color: value, temperature, intensity – all the keys to successful color mixing. And that was just the beginning! This course was an essential springboard to working with color. It has enabled me to pursue working in colored pencil, pastel, acrylic and mixed media pieces that have been so much fun to create. The reference book she provides has been a continual resource as I continue on the journey down the yellow brick road! Whooooooo Wants to Learn Pastel???? Get regular updates on upcoming classes and workshop by signing up for the newsletter.